When the weather is nice and quiet, we are more prone to some negative health impacts. Clear skies are often created by areas of high pressure, which also result in sinking, poorly mixed air. This makes it difficult for clouds and showers to form but also allows pollutants to settle and ozone to increase. An *AIR QUALITY ALERT* has been issued for the Baton Rouge area from 6am through midnight Wednesday. Levels are low enough that only those with breathing sensitivities such as asthma would be affected by spending longer periods outside. You can reduce emissions by driving less and refueling very early or very late in the day. In addition, the U.V. Index is very high at 9, making sunburn times less than 20 minutes. Also, grass and tree pollen is high. Today and Tonight: Keep it coming… more sun and warmth are ahead for the middle of the week. Highs will be near 90 degrees with light, southwest winds. Still, it seems as though humidity will remain in check until at least Thursday and maybe Friday. Overnight lows will be in the mid 60s once again. Up Next: Thursday and Friday will start to bring some change to the outside feel. Return flow off the Gulf of Mexico will allow low-level moisture to increase. Initially, this will result it a bit more humidity to end the week as skies stay mostly clear to partly cloudy. By the weekend, just enough moisture should be available for daytime heating to trigger an isolated shower or thunderstorm on Saturday afternoon. Though small, that appears to be the best shot at rain in the 7-Day forecast. 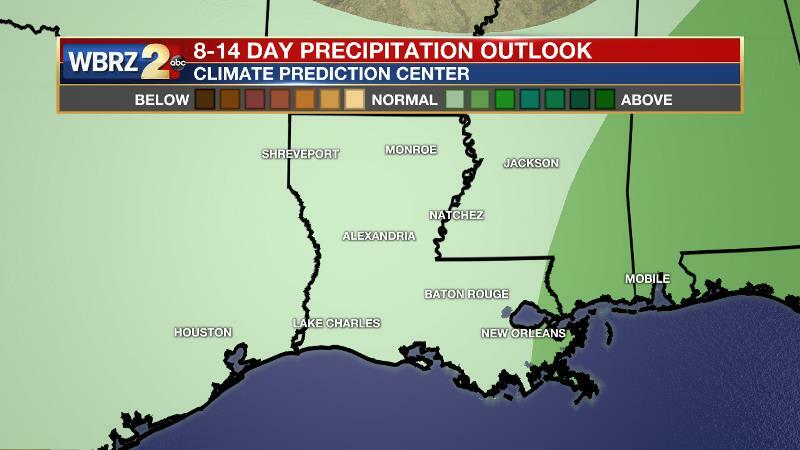 Running a one-inch deficit for the month, the Climate Prediction Center 2 week forecast offers only a small chance of above average precipitation. Keep watering those lawns and gardens! An area of high pressure at the surface will move from the northern Gulf to Georgia by Saturday. The high will be close enough to the local area to keep convective development at bay through the week. Thanks to mostly sunny skies during the afternoons, high temperatures will continue to outrun forecast model guidance. 90 degrees seems possible each of the next several afternoons. Additionally, since humidity will be slow to return, the more efficient warming properties of dry air support this idea of highs going above model guidance. A more southerly flow will return as we approach the weekend. By that time, the atmosphere may uncap just enough for this moisture to trigger an isolated afternoon shower or and thunderstorm. However, rain chances will remain quite low for the time of year. There are some signs in the forecast models that an upper level trough moving from east to west across the Gulf of Mexico could enhance rain chances by the middle of next week but it is still too early to place any bets on this.